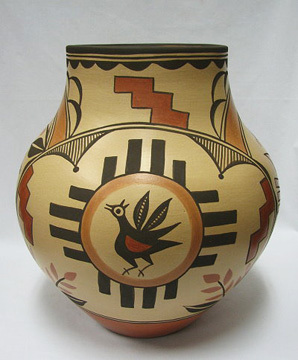 This is very large jar or olla that Elizabeth Medina of the Zia pueblo executes in masterful fashion. This jar measures 12.5 inches high and 10.5 inches in diameter at its widest part. 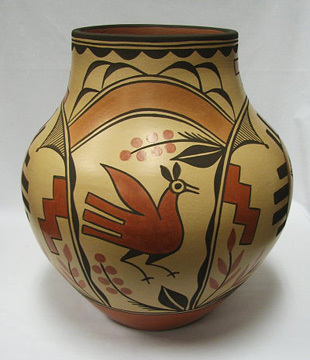 It is decorated with stylized versions of the Zia bird, or roadrunner along with sharply colored bands and floral arrangements. 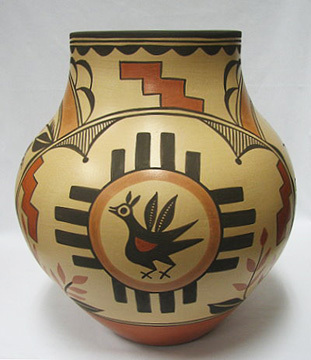 Two of the birds, on opposite sides of the jar are at the center of a sun symbol. 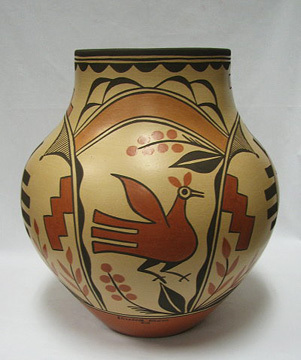 This is a rare design on Elizabeth's pottery. The decoration is simply elegant, arranged with a sharp eye for space along the surface of the pot. Note the stunning combination of traditional Zia designs with fineline work!